Nothing fancy here, just an easy side dish. 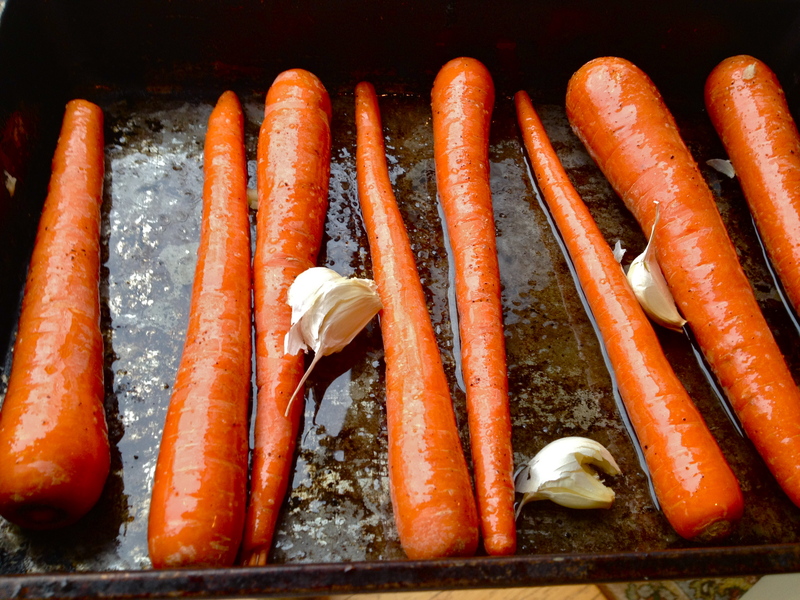 But there’s something kind of magical that happens when you roast carrots this way. They develop a silky texture with a warm, rich flavor that’s both sweet and savory. I love these—if you’re not usually a cooked carrot fan, make these and you will totally rethink your stance on the vegetable. They go great with baked chicken, lamb steaks, pork chops, and almost any other simple main dish you can think of. And the added perk that makes me even more excited about this recipe is the garlic cloves: after the carrots are done and the cloves are softened in the oven, toast up a piece of crusty bread, slather it with some good butter, and then spread the garlic all over that baby. Just don’t try to kiss anyone afterwards. Or alternatively, make them eat some garlic, too. 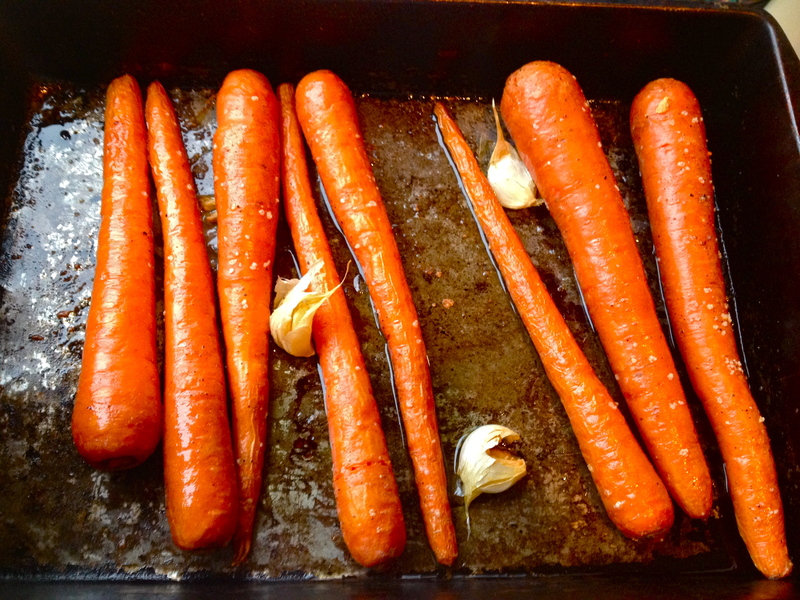 In a pan or baking dish, toss carrots in olive oil, salt, and pepper. Drop in the garlic cloves. Bake until tender and slightly caramelized. Yum. Previous Back from Scotland! and a Strawberry Custard Tart Recipe. Hi Kelly in the kitchen!! tried calling you the other day to tell you about this hilarious/ amazing Russian grocery store I found down our block!!! love and miss you, talk soon! put festivus on the calendar it’s the 23rd!!! I was in Scotland!!! Jealous of your Russian store – Kels told me about it! Festivus is on the calendar, CAN’T WAIT AS USUAL!! If you love these try chopping up and adding yukon potatoes, parsnips, butternut squash and toss with olive oil, thyme, rosemary,S&P and roast. Can be done ahead and the spread in baking dish with chicken thighs or in a dutch oven with boneless sirloin cubes and broth. YUM! Oooo that sounds so good!!! Oh and onions chopped up, can’t believe I forgot them!